The Expert Advisor repeats trades and positions a preset number of times on your account. exp Duplicator for MT4 and I cant load now in my Chart please help. Error duplication only "positions" fixed. - Warning: typos have been fixed in certain parameters. Check your settings if you changed them. the main deal if SELL with stop loss = 100 points, take profit = 300 points. the duplicator copies: BUY with a stop loss of 300 points and take profit = 100 points. the main deal if SELL with stop loss = 100 points, take profit = 300 points. 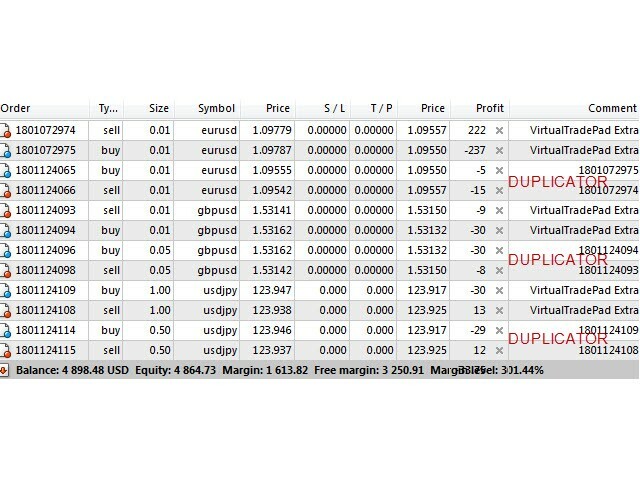 the duplicator copies: BUY with a stop loss of 100 points and take profit = 300 points. - Algorithm processing speed increased for better performance and signal receiving. Added the DuplicateOnlyInDrawDown parameter for filtering the EA operation. DuplicateOnlyInDrawDown - the EA operation only when the account is in a drawdown. The drawdown is calculated based on the maximum recorded account balance. It is possible to specify the balance for calculation in the StartBalance variable. 0 - the EA will automatically calculate the maximum account balance. The duplication starts only when the balance (AccountBalance()) decreases. If the balance recovers, duplication of new orders is suspended until the new drawdown. If the balance grows, the drawdown is calculated based on the new maximum level. In other words, duplication of new orders (from the moment of receiving a balance drawdown) starts only when positions are closed in a loss. Added a new block - Clients TPWCM EXTRA SETS Stops when Master Close Pos. When the block is enabled: If a position is closed on the source, the position will not be closed on the duplicator. Instead, a trailing stop or breakeven function starts on the duplicator for that position. That is, instead of closing, the duplicator allows trailing the position further. In this case, the trailing stop settings are individual. It is enabled only when the position is closed on the source. If set to false - the EA places take profit in any area (even negative one). Added the OnlyCloseOrders option, which allows the EA only to close the duplicate positions. If signal provider starts going into a noticeable drawdown, the deposit may not withstand. In the most stressful situations, it is possible to completely disable copying (OnlyCloseOrders=true) and disable opening duplicate orders to avoid overloading the deposit. The EA will stop opening new positions, but will still close positions opened earlier. If their original (master) position is closed by the signal provider. Added new parameter MaxLotToDuplicate - maximum lot for the duplicate, which will be copied. CloseOriginalifDuplicationCloseinProfit - close source position, if the duplicate position was closed with profit. Profit coverage of duplicate and source positions. E.g. if ReverseDuplicate=true and KoeficientLotDuplicate=2, after opening a sourc eposition the EA will repeat it with a reversal and a double lot. Further, if the duplicate position is closed with a profit and this profit covers the loss of the source position, the EA will close the source position. These parameters adjust automated lot and free margin calculation. Added the ReopenClosedDuplicateOrder parameter allowing you to manually re-open duplicate orders if they were closed by a stop loss. If 'true', all master positions are duplicated. If any of the positions was closed, the EA duplicates it. If 'false', no duplication is performed. Added the OnlyNewPositions parameter allowing you to duplicate only positions that were cancelled after starting the EA. If 'true', the EA copies new trades only, while the previous ones are skipped. CommentToDuplication = a comment for deals to be repeated. For example: CommentToDuplication="The X" - in this case the EA will only repeat the deals opened with the comment "The X"
You can also specify a part of the deal comment. You can enter CommentToDuplication="TickSniper", then all deals with the TickSniper word in the comment will be repeated on the account. Fixed a bug which caused lots to increase after requotes. CopyOnlyLossPosPoint - duplicate only the items that are less than the specified loss in points (indicated with a minus), 0 - off. CopyOnlyProfPosPoint - duplicate only the items exceeding the specified profit in points, 0 - off. Fixed bug when closing the position using ReverseDuplicate.